that was probably awkward: Whiskey Night: Now With Audience Participation! After gorging ourselves silly at New Yeah Shanghai Deluxe last night, RL and I retired to my new favorite not-quite-local, where we gloriously reinstated a once-longstanding Monday night tradition: Whiskey Night. Back in 1999, he and I and another fellow, RW, became fast friends when we all found ourselves in the same incomprehensible Tuesday morning graduate seminar on Gilles Deleuze. We decided to meet up on Mondays, the evening before class, to try to work through the readings together. These evenings quickly devolved into an excuse to drink (how else to get through a Deleuze text? ), and Whiskey Night™ was born. Even after the seminar ended that semester, RL and I kept up Whiskey Night, as an excuse to catch up, and also to listen to (and eventually play) music. The nights ended only after he moved out of Ithaca several years later, but now that we're both back in the same town, we've been trying to bring back the Monday night tradition. One of the great things about Whiskey Night besides 1. its name; 2. its occurrence on Monday nights; and 3. the whiskey, is the conversation. For inexplicable reasons, we end up having ridiculous talks about just about everything imaginable. And the thing is -- it's not just the alcohol creating the mayhem; RL and I drink together, elsewhere, on other nights, and the conversation is never quite so completely inane and wonderful, all at once. We've discussed the gastronomic provenance of the Meximelt, how movies aren't about moving images (the images don't move! there are just a lot of images displayed in rapid succession! ), and well... you get the idea. There's something -- dare I say -- magical about Whiskey Night. Last night was no different. The main topic of conversation, a two-parter: When did U2 go so horribly awry, and is it the case that everything the band (especially Bono) has touched since that moment has also gone awry? After quickly agreeing that 1991's Achtung, Baby was the band's last great album and also their point of no return, there emerged myriad answers to part two: Wim Wenders, the Pixies (who toured with the band during the Achtung Baby tour -- in fact, check out this link), Arcade Fire, Public Enemy, the Sugarcubes (to be sure, Bjork is doing just fine ... but the rest of the band...? 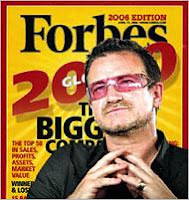 ), Rage Against the Machine, Al Gore, uh...Forbes, the iPod, Paul Wolfowitz (though he most likely was already on the path to oblivion before touring/touting Africa with Bono), Africa itself .... dear readers, are we missing anything? It's a veritable curse they've got on their hands! Three rounds of very generous pours of bourbon later, we called it a night. But the curse rages on. Watch out! Bono might be lurking around that corner up ahead. The Meximelt? Are you sure that's not Jamaican whiskey your imbibing? ht, have i ever told you about how i once ate 13 mexi-melts, on my 13th birthday? well, that was the idea...i think i made it through 11 and a half. needless to say i haven't had one since. hoyt: i believe the meximelt conversation began as a general-confusion sort of thing: what was the difference, if any, between a meximelt and a beef burrito? and then from there the conversation just sort of spun wildly out of control. no jamaican whiskey, though i was at a party the other weekend that featured thai rum. needless to say, we didn't crack open the bottle. michael: i feel your pain. is this what turned you into a vegetarian? Drinking is bad for you. It leads to delusions of profundity, singular schmaltziness, a brief period of happiness, an hour or two of anxiety attack, and then, roughly eighteen hours after beginning, a severe compulsion to repeat. At least, for me it does.